Holy moly, we pretty much did it! A little heartbroken for sure that we weren’t able to get our hands on Eagle Rare 17, but really, in a lot of ways, these were each independently more valuable than Eagle Rare 17. We’ll count our blessings for sure. Trevor and I were actually at work when we got the text and were on the phone with each other the moment it came in. We pretty much freaked out. We planned our visit to go in after work. We walk in and [Steve] smiles when he sees us. Pretty much everyone was in that day, [Steve], [David] and even [John]. [Steve] walks over and shakes our hands and heads to the back while we wait in the whiskey aisle. We talk with [David] and [John], the store owner for a little as [Steve] walks back with two bottles, each in paper bags and hands them to us. As I try to take a peek at the Pappy bottle, he’s blocks it from view from others. “You should keep that in the bag,” he says, “I don’t want anyone seeing you got that here.” We laugh, but we know he’s serious. 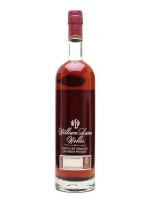 I tell him, “You know we’re popping open this William Larue Weller right now with you guys?”, I say. [Steve]’s eyes seem to light up. He goes over to talk to [John] about it. They had just secured their tasting license so it was cool. We head to the back room and grab some little Dixie cups and everyone gets a little. It is so great to share it with these guys. And each person (even their beer guy) was loving it. And guess how much we spend on each bottle? Less than $90 a piece. That right there, is doing it the right way. [Steve] tells us that no one else received as good a haul as we did this year. We achieved our second and third goals today – TWO GOALS ACHIEVED!!!! Believe in your dreams, people. They say “Aim for the moon. Even if you miss, you’ll land among the stars”. I gotta say, I feel better than that right now. We’re definitely not giving up on Eagle Rare 17. That will always be our goal until we get a bottle, but we’ll keep this thing going as long as we can. What’s next? Help us find some goals yourselves. Drop us a line in our Contact Us page. Feel free to subscribe for more updates. Nice score. You did it right by sharing a taste with the guys at the store. Well, there was a better way. Don’t drink it out of a Dixie cup.